At the start of the year I completed work on a new temporary exhibition at Elstree & Borehamwood Museum called "All Change!" 150 Years of Rail. Like many places in Britain, the coming of the railway increased the population dramatically and brought pioneers of industry to the town, including the embryonic film industry in 1914. It was due in part to the railways presence that Borehamwood became 'Britain's Hollywood' in later years. Elstree & Borehamwood Museum is only a single space with several glass cases located on the perimeter, but I was determined that this would not restrict the telling of this important local story. Previously, back in 2014, I had designed an exhibition to celebrate 100 Years of Film in the museum and I had managed to carve up the space without compromising the existing structures and graphics. Similarly I wanted the rail exhibition to incorporate all of the cases, but at the same time change the overall shape of the room so that it felt larger and took the visitor on a journey through history. By dividing the room into a series of cells, I could recreate the 1930s exterior of the old station, a ticket office and a station platform complete with train - as well as a full size driver's cab (using a well placed mirror) for the odd selfie shot! My role was Exhibition Coordinator and Designer which initially involved interpretation of the subject, conceptual layouts, visuals and branding. I crafted the written content with the help of a small core of fantastic volunteers before some of them headed off to construct the sets I had designed. The quality of construction, especially of the driver's cab, would put some professional outfits to shame! Finally, graphic design work was shared between myself and Hertsmere Borough Council's own Print Services. Final printing fell to the latter along with HertsSigns of Hatfield. Station staff, past and present, were interviewed by a local film school, with the guidance of Elstree Screen Heritage, informing some of the graphic panels and a centrepiece documentary in the exhibition. Funding support came from the Heritage Lottery Fund and the members of Elstree & Borehamwood’s “First Impressions” initiative (the Town, Borough and County Councils, Thameslink and Elstree Screen Heritage). 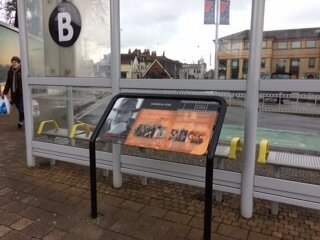 Over the past 10 years I have worked with “First Impressions” to produce high impact designs for public spaces throughout Borehamwood and create awareness of the town’s unique legacy. “Excellent display; brought back a lot of memories." Harrison Ford has finally landed in Borehamwood! Last year the residents of Borehamwood voted for Harrison Ford to be honoured in a special graphic panel - the latest in a series of film related interpretation throughout the town. With content written by Elstree Screen Heritage, this will be the 28th panel I have designed so far for the Film Heritage Trail. Harrison Ford was a regular visitor to Borehamwood in the 1970s and 80s when he filmed the original film trilogies of both Star Wars and Indiana Jones.